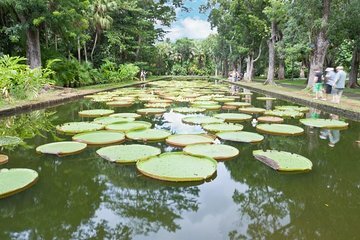 Get a taste for both the sweet and bitter history of Mauritius during this 8-hour private tour of the island’s sugar industry, slave trade and lush tropical gardens. Join your private driver for a customized exploration at your own pace, stopping to visit sights like Sir Seewoosagur Ramgoolam Botanical Garden, sample local rum and explore Château de Labourdonnais, a 19th-century colonial mansion. You’ll also learn about the history of the island’s sugar industry at L’Aventure du Sucre and tour Port Louis, the island’s historic capital city. This flexible private tour also includes private vehicle transport.